The 2014 Infiniti Q50 is Infiniti's new name for the G37. It brings new styling to the sport-sedan market, but will it stand out, or get lost in this new crowded segment? The first 2014 Infiniti Q50 rolled off the assembly line today in Japan and the head of Nissan/Renault, Carlos Ghosn, was there in a cool mechanic’s jacket to watch. If you are shopping for a near-luxury compact sports sedan and have never heard of the Q50, don’t feel bad. It is a new name on a car with a history. It used to be called the G37, and before that the G35. Someone at Infiniti has decided to rename a car that Infiniti has spent about a quarter century marketing and building awareness of in the highly competitive segment it strives to compete in. That someone is Johan de Nysschen, President of Infiniti Motor Company Ltd., and he will either be the new Don Draper over at Infiniti, or will be fired and hung in effigy. We should know which in about 6 months. The Infiniti G37 outsold its Japanese counterpart the Lexus IS350 series by two-to-one last year. To Infiniti that meant nothing because the BMW 3-series outsold the Infiniti G37 by two-to-one. Infiniti’s G line of sports sedans, convertibles and coupes, all based on the same basic car, accounted for more than half of all of Infiniti’s US sales last year. Since the car was so important to the automaker, you would expect the marketing plan to be pretty simple; Build on the name, improve the car itself, and stick to the current plan to incrementally grow sales so as not to upset the applecart. Instead of that plan, Infiniti is actually changing the name of the car completely and making incremental changes to the vehicle. The all-new car has the same 3.7 liter V6 and also lesser engines from the prior G. New will be a hybrid powerplant that Nissan installs in many of its cars with a 3.5 liter V6. The body is all-new and looks a lot like all the other new cars being launched today. That being pug-nosed up front, with a lot of swoopy lines along the sides. It looks a bit like a BMW 3-series with an Infiniti grill, which is sort of the point. The entire near-luxury sport sedan market used to account for about a quarter million vehicles in the US. That segment has grown because it is a high-value point for sporty luxury cars, but also because the cars grew up. These cars no longer feel cramped for the front passengers, and kids can comfortably ride in the back seat, as can one’s minions if the car is being used to transport co-workers. You can’t put your boss back there and remain employed, but why would you? The cars are also the fastest sedans under $50k on the planet. In fact, they pretty much come with all the power and go-fast equipment that one can use on US roads and highways. That is why the larger sports sedan sell in lower numbers. Last year the G line sold about 60,000 units in total. With the new car one would imagine Infiniti would grab market share. However, it is possible someone moved Infiniti’s cheese. The new Lexus IS350 one-ups the Infiniti in many ways. It has one more forward gear in its transmission (8), has added 3 inches of legroom in the back, and the looks are striking. BMW on the other hand has gone decidedly downmarket. It offers “leatherette” seating and a small 2.0 liter four cylinder at price points where the competition is already selling sixes and seating made from four legged animals rather than a plastic extruder. And it’s working. Meanwhile, Cadillac, who was never even in the running with these cars since its smallest car, the CTS was a different type of car, now has a great new ATS which is pretty much a carbon copy of the BMW 3 Series line. In its first year the baby Caddy took a huge bite of the market. This year it is on track to sell nearly 36,000 ATS variants. Infiniti may find its car with a name nobody ever heard before gets a little lost in the now very crowded, and very competitive sports sedan market when it goes on sale this summer. 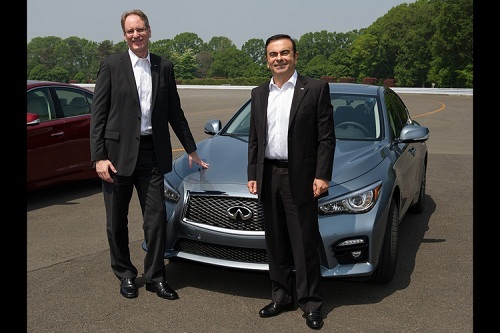 Photo shows Carlos Ghosn to the right of the Q50, Johan de Nysschen to the left. Rumors that Mr. Ghosn has a bonus check in one pocket and a pink slip in the other are strictly that.